Why Be Curious? A lively and still Scarpa-esque blend based on Dolcetto, with Ruchè, Freisa, and Barbera for additional aromatics and fruit. 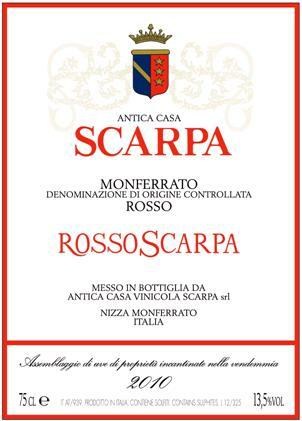 “Velvet and flowers” is how Scarpa describes this wine. It’s bone dry, by the way. Cantina / Cellar: Fermentation and aging for at least a year in stainless steel tanks, followed by a minimum of three months (and usually much longer) in bottle before release. Il Vino / The Wine: A wine that combines Dolcetto’s great texture and friendliness at the table with other native Monferrato varieties for aromatics. A Tavola… / At the Table… Use it as you would Dolcetto: antipasti, vegetables, first courses, sausages, and soups. Nome / Name: Poderi Bricchi, in Castel Rocchero (Monferrato). Ettari / Hectares: 27 hectares (for all Scarpa wines other than the Nebbioli). Quota / Altitude: 400 m / 1310 ft.
Vitigni / Varieties: 55% Dolcetto d’Acqui, 15% Ruchè, 15% Freisa, and 15% Barbera. Età delle viti / Vine age: Planted between 1993 and 2003. Fermentazione alcolica / Alcoholic fermentation: In stainless steel. Élevage: In stainless steel, plus at least three more months in bottle before release.